Turquoise semi-precious beautiful opaque stone gives its name to the color. 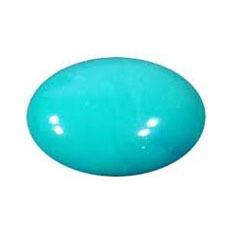 Turquoise is a valued gemstone that was named after Turkey, the region where it was first found. This multi-purpose stone is thought to aid in granting courage, attracting money and promoting harmony in love and friendship. However, the most common use is as a protective and healing stone. Native Americans used turquoise to heal the land in times of drought and for protection of travelers or people in transition. You can get this beautiful stone from our online shopping centre. For children recomended ratti 2 to 3, for minor 3 to 4 ratti and for adults 5 to 12 ratti.